Nazareth Hospital in Mineral Wells, Texas operated from 1931-1956 but, I think the building may be older than that. It was considered a clinic and opened shortly after the Crazy Hotel opened its doors in 1927. The Holy Sisters of Nazareth purchased the building for $135,000 (about $2,011,090 today) and moved into the top floor of the 46-room building to serve the patients. The building was closed in the 1960s. But the clinic itself was temporarily housed in the Crazy Hotel until 2009. Then it was moved to its new building. In the late 1980s through the most of the 1990s the Nazareth housed the Palo Pinto County Service Corporation that included Head Start, JTPA, Emergency Food Program, Civil Service, Social Security, and the Family Planning Center. I think this history is a bit lacking but I can’t find much information about the building. We have received a lot of helpful personal accounts of family members speaking about being born there or having some sort of operation there over the years. Some even having an operation there after the official move date was listed. 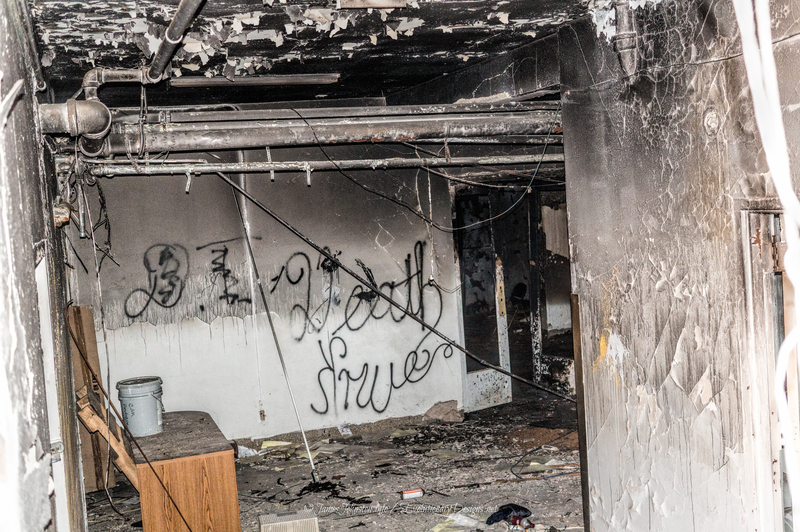 Back in 2015 I spent some time wondering around the exterior of the building and it looks in pretty good shape but from what a couple of local police officers told me, the interior is in rough shape including a fire that damaged a good part of the basement and animal/human feces throughout the building. On my second trip to Mineral Wells to visit the Nazareth Hospital the basement door was wide open. Although I was tempted to go in, I just took a few shots from the door way. As you can see just from the entrance, its bad. You can see the trash piled up, the old computers that were left behind when the last residents moved out, you can see the fire damage, and the water damage from when the fire was put out. I am curious to see how well the upper levels are holding up. When you peak through the front door windows, you can see where people got up from what they were doing and left their coffee on the table. If the building has been vacant since the 1990s, then it’s amazing that the coffee and office equipment the front offices are still there after all those years. Sometime in 2016 or 2017 a fence was installed around the exterior of the property to keep adventure seekers, photographers, vandals and scrappers out of the building. Can some please give the date when the fence was added. During my next visit I will add current photos of the building. 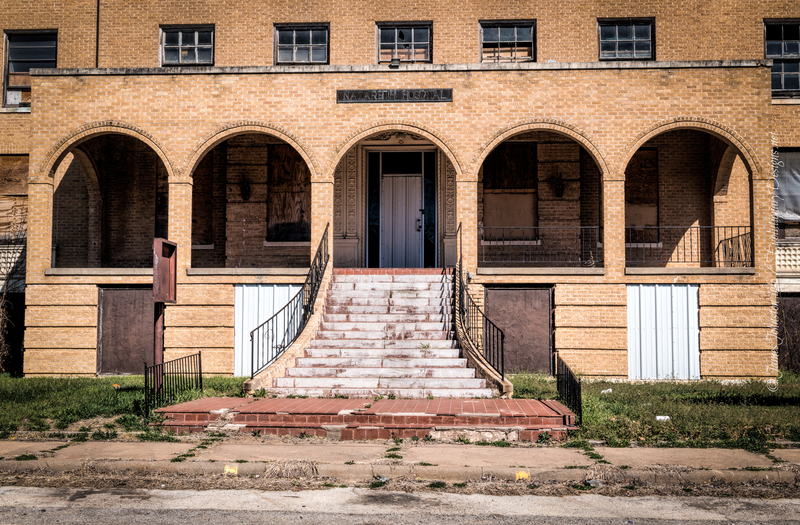 We have exhausted our research of the old Nazareth Hospital in Mineral Wells and we need your help finding those leads. If you know anything about the history, that would help us out a lot. We are also looking to speak with the owner, past owners, or members of the staff that may have worked there. If there are any old pictures of the Nazareth Hospital in Mineral Wells, we would love to share them with the readers of this site. If you have any leads for us, please contact us by using the contact page or by messaging us on the Facebook Page and let us know what you have for us. In the near future, I will be making a trip back to that area and plan on talking with neighbors and local business that may have known more about the old hospital. Author’s Note: This article was originally posted on my personal blog on March 16th, 2014 and rewritten and posted to VanishingTexas.com on July 17th, 2015. That site is no longer affiliated with us. All content from that site is slowly being migrated and updated to this site. All photos featured on this article were taken a few years before 2016 unless noted. Shots taken with a Sony Nex-3N/B with E 16-50mm f/3.5-5.6 OSS PZ kit lens. I then processed it with Adobe Lightroom to crop, straightened, and remove dust spots from the image. After that, I post processed the image with Topaz Labs Clarity to add more texture, remove shadows, boost brightness and contrast.